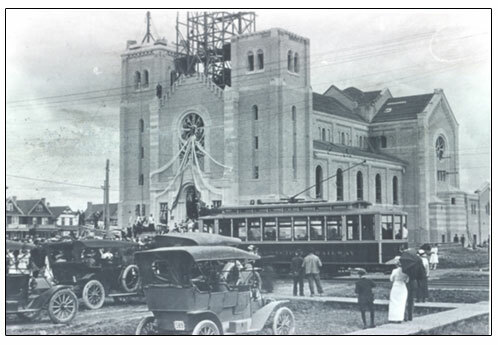 Above: Opening of the 13th Ave streetcar line, 1911. City of Regina photo. Some yearly snapshots of Regina’s historic 13th Ave., home to Connaught School. Sacred Heart Academy, a girl’s boarding school, opens (today’s Cathedral C0urts). Construction of Connaught School and Westminster Presbyterian (United) Church. Blessing of Holy Rosay, 1913. Public Domain photo. Connaught Library constructed at a cost of $22,000. In 1950 there were two tea rooms where the Safeway Parking lot now is: the Quality Tea Room and the Capital Tea Room. The Quality later moved to Robinson Street. There was no shortage of groceries throughout the history of 13th Ave. At one point there were not one, but two, Safeway stores. The current Safeway, built in 1962, is one of the last examples of marina-style architecture in North America. In 2012 it is undergoing an extensive renovation that will not preserve this style. Good eats at 3414 13th Ave.
Read: “Learned to Make Sausage” – Memories of 13th Ave. Your comments, corrections and memories are welcome!